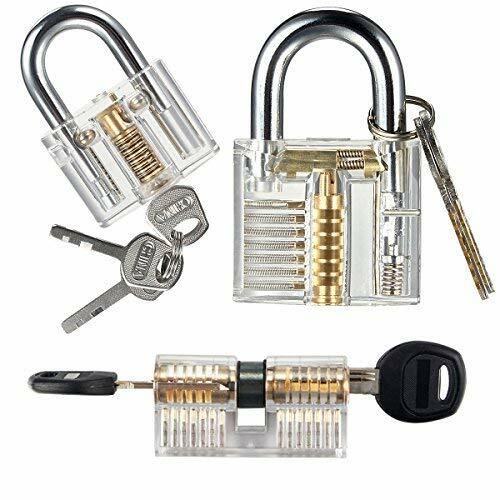 Practice Training Cutaway Padlock Set, Includes 3 Different Common Clear Crystal Transparent Padlocks with 7 Regular Keys + 5 Training Tools Practice Keys (Credit Card) Kit for Kids by zipra at N Online Agency. Hurry! Limited time offer. Offer valid only while supplies last. VISIBLY TRANSPARENT CUTAWAY- With these set of transparent cutaways, learning is greatly enhanced as it avails beginners the opportunity to know the mechanism behind how the padlocks work. GUARANTEED SATISFACTION- As your satisfaction is paramount to us we can assure you quality and in the case of any difficulty experienced with it's use, we are always available to help. If you have any questions about this product by zipra, contact us by completing and submitting the form below. If you are looking for a specif part number, please include it with your message.